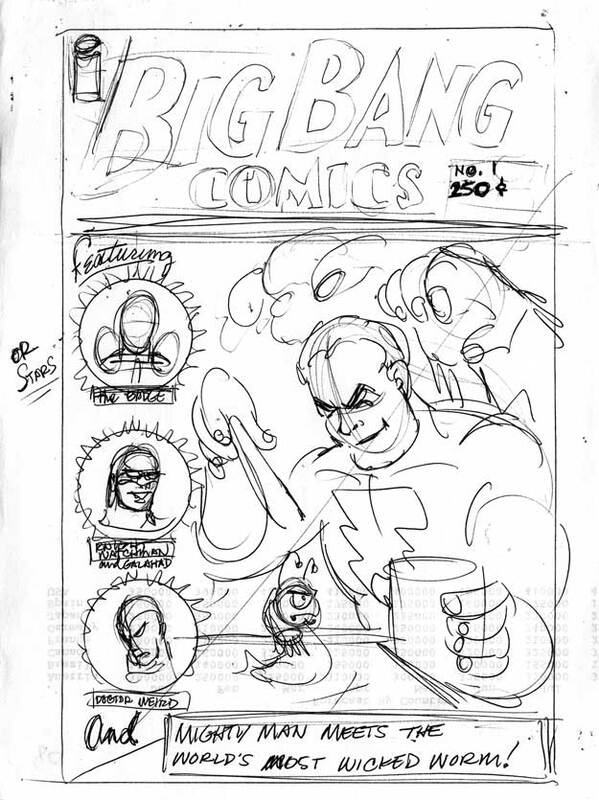 BB Chronological 17: A NEW IMAGE FOR BIG BANG COMICS. Starting over? A new beginning? It didn’t really feel that way after leaving Caliber Press to join Image Comics. Most of the material in the first few issues at the Big “I” was in the works before we left Caliber. The interiors were still in color. Had we hit the big time? I don’t know. We knew that we had the chance to reach a wider audience so we just kept plugging away. We decided to hit the ground running and lead off the new run with a few Image characters. 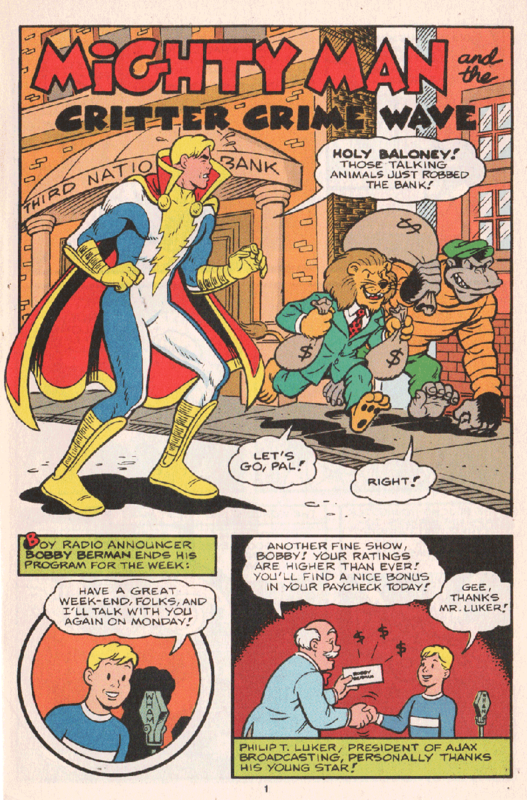 Erik Larsen’s Mighty Man starred in volume 2 number 1, and Jim Valentino’s (Silver Age) Shadowhawk guest-starred in number 2. Mighty Man went way back to the beginning of my career in comics – – my independent comic Megaton! The World’s Mightiest Man was present in the first batch of samples and character designs that Erik had sent me prior to our collaboration on the Vanguard stories in 1981 or so, and he first showed up in Megaton #2. Here we were, 15 years later and I was working for Erik. 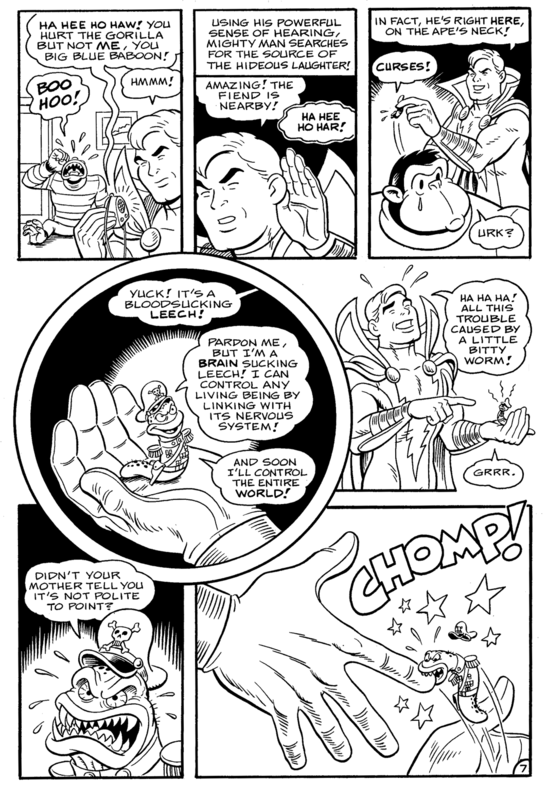 We did a few Vanguard mini-series, and Mighty Man was appearing in Savage Dragon. Erik was (and is) a big fan of the original Captain Marvel. I think he grew up reading his Dad’s comics collection. Me? I started with DC’s 1970s revival (unless you count Steranko’s History of the Comics and the one page that DC allowed Jules Feiffer to reprint in The Great Comic Book Heroes) and worked my way backward. Thunder Girl was technically Big Bang’s homage to the Big Red Cheese, but we were thrilled to get the chance to do Mighty Man. Bill Fugate’s art was as perfect for MM as it was for T-Girl. The villain of the story was the Wicked Worm, a leech that could mind-control any living being it latched on to. While obviously an homage to Cap’s own worm Mr. Mind, it also tied in to the villainous Horde that was wreaking havoc in Savage Dragon. Horde was a pile of the brain-sucking leeches. I figured that the Wicked Worm was the first of many. My co-conspirator Chris Ecker drew a layout for the front cover and Bill Fugate finished it up beautifully. Chris also wrote and penciled a Knight Watchman story, the second feature in BB #1, which was inked by Jim Brozman. The Sinister Quizmaster introduced Nestor Whitt, a television game show writer gone bad. 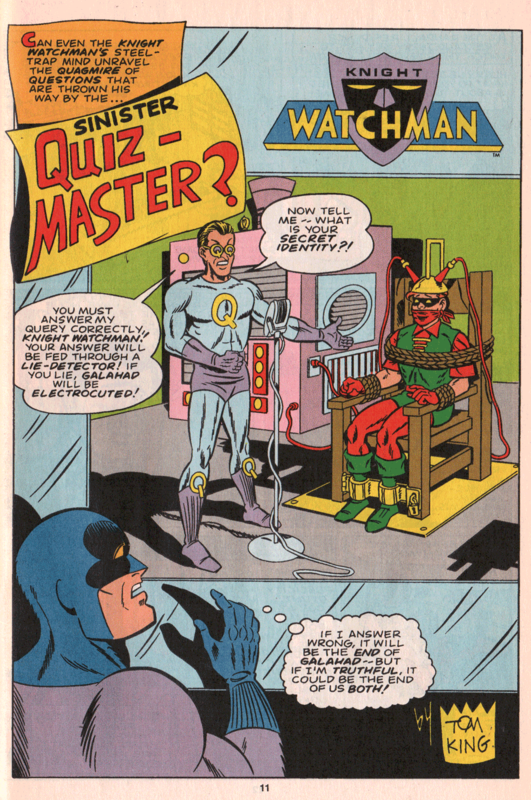 The Knight Watchman was forced to match wits with the Quizmaster, who had strapped the Twilight Paladin’s sidekick Kid Galahad in an electric chair. While KW evaded the villain’s questions designed to expose their secret identities, Galahad escaped and socked his captor. Rounding out the issue was a two page Dr. Weird prose story, written by Ed DeGeorge and illustrated by Stephanie Sanderson (now Heike). In The Master of Ghosts, Dr. Rex Ward faced off against an old man with a golden amulet who called himself the Ghost Master! Although he himself was dead, the Golden Avenger was able to disobey the amulet’s power, so the old fiend called upon the ghosts of Aaron Burr, Tecumseh and Cleopatra for aid. Volume 2 number 1 was one of our strongest issues ever, but my own favorite piece in the book was (and is) the introduction on the inside front cover by Big Bang scribe Terrance Griep, Jr (also known now as the indy wrestling star Spider Baby). He introduced us and some of the characters, and told the readers what to expect in the future. 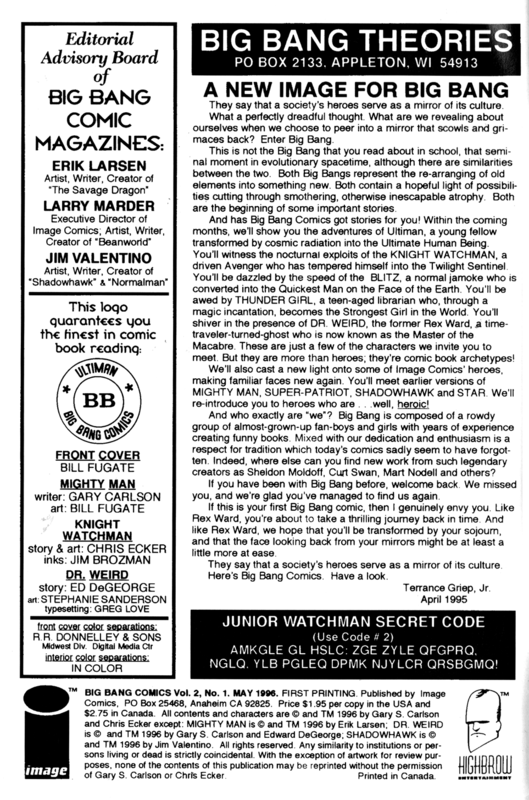 Toward the end of it he wrote “If this is your first Big Bang comic, then I genuinely envy you. . . you’re about to take a thrilling journey back in time”. Do yourself a favor – click on it and read it for yourself.